Wow! 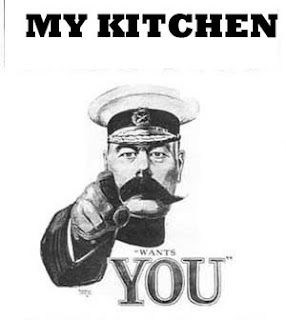 thank you all so much for your response so far to my kitchen advice plea. It is all very useful indeed. Just one more question. Dennis made the mistake of leaving half way through our joint internet shopping session tonight to go and watch football. that was fine by me - I am happy to do the research and then report back with options. But he has to be aware that if he leaves me and I fall in love in his absence, all his budgetary caution shall be scattered to the wind. I found THE tap. * Just the one I was searching for. Silly price but I am in love. I was searching for a handsome tap with a sleek pull out hose with a rounded control that was centrally placed and which swivelled and had a good sense of humour and was non-smoking - harder than you think. 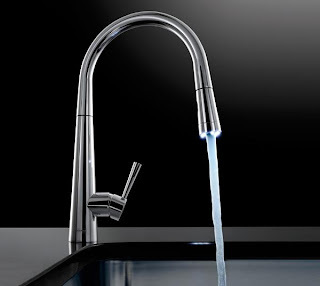 This Franke one was one of three that fit the bill but - oh be still my beating heart - it is black. So it's all matchy-matchy with the black sink and black microwave and black extractor and... you get the idea! I like matching and I didn't even know you could get black taps. So on colour alone it was a must buy. But - and here is where I need your help again. It has an added feature, as you can see in the picture of the steel version below. LED lights in the spray. Now this is surely extremely cool and, as I assume Swiss precsion means this is achieved without the risk of electrocution, amazingly clever. 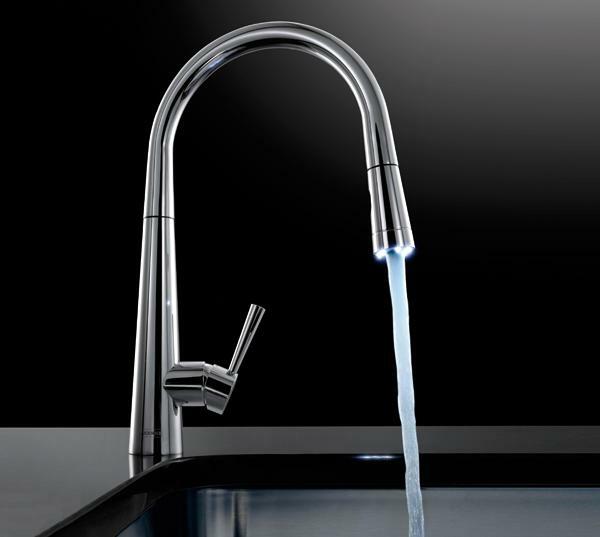 But why on earth do I need LED lights in my tap spray? * I know, this used to be a quilt blog. Give me time and I promise quilt show photos from the US. At midnight last night, as I found myself, in my PJ's measuring packets of cornflakes and quaker oats with a builders tape measure I came to a conclusion. I have had many emails and blog comments saying how much you are looking forward to seeing our house develop and how much fun it will be to watch the process. Which is great. Because I am having great fun too and I am all for sharing the joy. But you know, along with the fun goes the work and, well, you might all be having vicarious fun but I don't see any of you measuring the circumference of a tin of beans for me, do I? So I decided that I shall tap into my reader resource a bit more. Tell me a good and a bad thing about your kitchen. Or more if you like. What do you love - be it an applicance, a colour, a fancy gadget for turning tomatoes into swans - whatever. What would you not be without that you use all the time? What makes you happy about your kitchen? And what don't you like? What little thing niggles and annoys you. What would you change if you could or what mistake did you make when you fitted your kitchen? Or maybe tell me what amazing thing you saw in a shop that you would love to have in your kitchen. That way I can ammass all your wisdom and apply it to maximise good design and minimise regrets. And in return? Well I shall keep amusing you with tales like how the electrician came back today. And told us that the metal lights in the bathroom - you know, that room with all the steam and water in - no earth wire. Oh, and the shower is illegal. And you know how he was in the house to do the extra sockets in the dressing room becuase the fitted wardrobes are coming soon because all my clothes on the temporary rail fell on my head.... We do realise that if we fit them he will have to unfit them to do the electrics for the kitchen below? Hence why the kitchen gets done soon. And while he was at it he told us that to rewire all our exceedingly dodgy sockets and lighting fixtures he needs to take the flooring of the upstairs out and really we need to move out of the usptairs for three days. Problem? Not at all. I am going to give a key to the electrician and move out to California. And when I come back I will not longer have to wonder whether naked flame candles are a more or less risky alternative to my light switches..
Oh and in case, you were wondering about the cereal packet measuring. I was almost asleep when it occurred to me that if we got said electrican to move a light switch then, instead of leaving a small gap between a wall and a run of cabinetry in the kitchen ( to allow us to get our hands down the side of the cabinets to get to the switch) as the planner had suggested, then, as long as I change the radiator at the other end of the run to one 10 mm narrower we could swap the 300mm pull out larder to a 500mm. Was it worth the effort Dennis asked. Would we get all that much more in or would we just have usless space around what we would put in the 300mm cupboard? Don't really know. Turns out the answer is about 55 packets of Quaker Oats. It was an accident. I swear on my fabric stash it was. You see, everything is temporary in our house at the moment and that includes the shade on my bedside lamp. It is slightly too big but it does a good job of temporarily replacing the one that got broken in the packing. Only, it being slightly too big, when I caught it with my hand as I tried to put the light out, it slipped and overbalanced the lamp base. Which toppled onto the water carafe, which poured its contents over the radio alarm clock. Now I did scoop it up quickly, but the first dribbles seem to have seeped into the base. And caused the radio to come on. Which ought to be a good sign of me not having drowned the thing. Save that it was on even though it was turned off. And would not turn off, whatever buttons I pressed. Radio 4, on and on and on. (Dennis likes us to wake to the Today Programme. For myself, I would choose something more serene or upbeat. But I will give you that having to listen to John Humphries interupting and hectoring a politician who is intent on ignoring both question and reality in their desperate attempt to convince me of the sense of whatever inane policy they dreamt up overnight does get me up quickly. Newshound Dennis manages to snooze serenely through the first twenty minutes or so of the baracking and slimey avoidance). Of course, the radio turned off when I did the electrical equivalent of smacking its bottom for tantruming and pulled its plug out. But when I plugged it back in, it started again. Not good. But not a disaster, because a little while ago my Dad won an ipod docking station/ alarm clock and a large bar of chocolate in a raffle. Dad having no real need of (or idea what to do with) a docking station, I was given it the day before this happened. My ipod-less sister got the chocolate. So I get up and go and get it. It has four pages of instructions. All of which have large simple diagrams for 'quick set up'. None of which tell me how to tune the radio. And of course I am only reading the instructions after I have spent time trying to fathom it out myself. It suggests I download the manual online. At gone midnight? Not good. But not a disaster, because it is after all, a docking station. So I dock my itouch, set the alarm and go to sleep. Or I would have done if Dennis had not, within five seconds of it going off, sat bolt upright and demanded, "What is that?" That, my dear Westminster-Village-wannabe-resident-political-conflict -thriving husband of many years, that is Annies Smith's quilting podcast. It was, I swear on my stash, an accident. PS. By the time I got home he had fixed the original alarm clock and asked me,"What is Patchwork Tsushin anyway? The good news - finally (but not until Talk Talk reduced Dennis to tears with their appalling service and need to spend hours on the phone to call centres who did anything but what they said they would do) the home wifi is working! I am back in blogland! The bad news. The electrician came to check the electrics in the new house. His exact comment on this socket? "Bloody hell. Don't use this one!" His comment on our fuse box? "This is twenty years old. Its working fine but it will go eventually. And when it goes, normally I would say you will never get a part for it, but actually I've got an old one for parts in my garage. And you know where I got that from? Its the one I took out of your last house." Well, its nice to recycle isn't it?! Imitially my thrifty little sister gave us some grief about wasting money by employing a removal company and not just getting a hire van and doing some work ourselves. When she rocked up at 3pm and saw these vans I think she understood! And besides. It was quite hard work watching. Kitchen: to be replaced very soon I hope. Oh aren't empty rooms so interesting?! Although these have now disappeared. I fear they may be steak. Little sister, despite her scorn turned out to be quite helpful in getting us settled, scrubbing away happily. And yes, I know and no I could not wait! As I expect you can tell, the house needs work in every room so we shall be doing bits as we go along starting as soon as we stop going away for holidays (Bath for the next fortnight and California for me in the first fortnight of October, Ireland for Dennis. And don't be taking his side on that one. It was his choice!). We are glad that the frst task - due to be completed in three weeks - was always going to be replacement of the hot water system with a combi-boiler as this week the hotwater stopped heating then the pipes started to make alarming screaming sounds that caused us to have to stop even trying to heat the water. Clearly Something Is Not Right! I have inspiration for all this work in the form of my old school friend ( well, she is not old, not much older than me anyway, but you know what I mean!) who now uses the moniker Working Mum. She is posting the before and after photos of her house renovation on her blog and I am glad to say is visiting soon when I hope she will reassure me that there is life after inherited white anaglypta wallaper and faded mottled brown carpets everywhere!